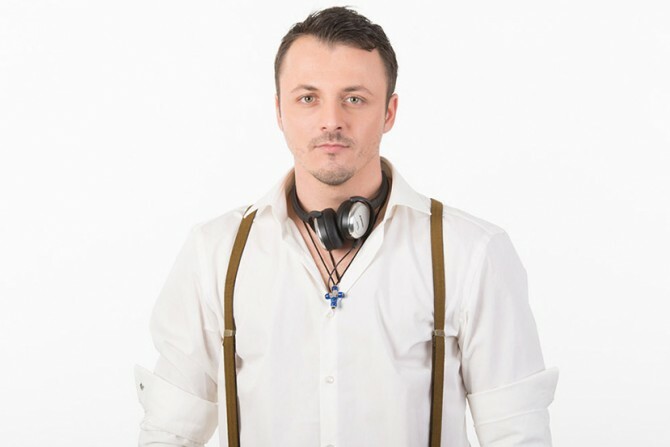 Daniel Kajmakoski (Даниел Кајмакоски) was born on 17 October 1983 in the city of Struga, located in South Macedonia on 17 October 1983. He was named after Daniel Popovic, who represented Yugoslavia it the 1983 Eurovision Song Contest. When he was just 7 years old his family had moved to Vienna, Austria. "Eurovision" will be held three hundred meters from the place where I grew up. It will be very emotional for me, but I am completely motivated and ready to defend the colors of my country. At least for accommodation I will not have to spend money (laughs). I will have a little more time with my mother because I'm missing her a lot"
Daniel has two brothers, older Dalibor and younger Filip. In early years together with his father Pavle, Daniel performed at weddings, baptism ceremonies etc. Daniel has also participated in many musical shows, the first time when he was 17 he participated in Austrian Starmaniа show in 2003 and reached the top 12. In 2009 was his first performance in Macedonia at Ohrid Fest with the song "Nezhna ko princeza" which was composed and written by himself. Daniel has also participated in the Bulgarian show "Pej Samen". After that he returned to Vienna where he got a non-music related job, but meanwhile he always worked around the music as well. In 2011, he wrote a song for Karolina Goceva titled "Ne se vrajkas", which become a huge hit in Macedonia and on the rest of Balkans. In 2013 Daniel took part in the 1st series of "X Factor Adria". At the auditions he performed the song "Red" by Daniel Merriweather impressing the judges and the went on to win the whole show on 23 March 2014. During the show Daniel has performed hits of U2, Kings of Leon, Robbie Williams, One Republic, Avicii, Hurts, Toše Proeski, Vlatko Lozanoski and Željko Joksimović, Serbian ESC 2004 and 2012 representative who served as one of the judges in the X-Factor responsible for "Over 27s" category to which Kajmakoski belonged. Duet with Joksimović "Skopje-Beograd" was the first single released by Kajmakoski as the winner of the project. In 2014 Kajmakoski was awarded "Discovery of the Year" at "Golden Ladybug" ceremony. His song "Ne mogu protiv srca svog", soundtrack for the movie "Bićemo prvaci sveta" directed by Darko Bajic, charted on top of MTV Adria chart. In the end of the year he has released duet with Tamara Todevska (Eurovision 2008) with "Za mig" written by Robert Bilbilov and Ksenija Nikolova. In January alongside Alexander Rybak, Marija Šestić, Oceana and other famous artists, Kajmakoski performed official Handball WC in Qatar anthem "Live It". Daniel's favorite food is green beans, favorite color is turquoise. His biggest idols are Tose Proeski, Justin Timberlake, Bruno Mars and Chris Brown. He likes to listen to hip-hop and RnB. One of his favorite books is "The Greatest Salesman in the World", and his favorite movie is "Avatar". At the Eurovision Song Contest Daniel will perform "Lisja Esenski" - his very first solo single, and track planned for his debut album. The lyrics have been written by Daniel together with Aleksandar Mitevski on the music of Swede Joacim Persson (from production team "Twin"). 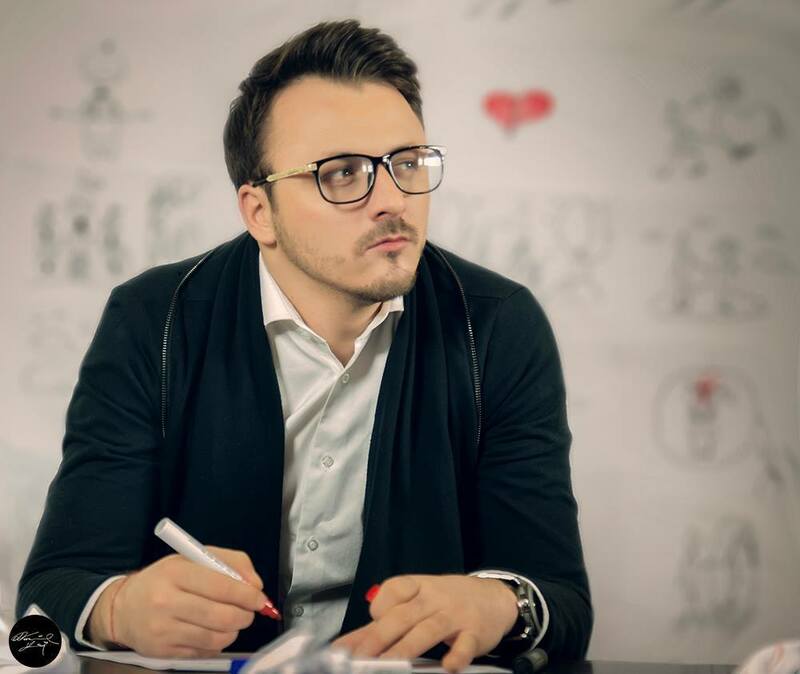 It is a first time foreign composer is behind Macedonian Eurovision entry. The arrangement for Skopje fest version was created by Aleksandar Mitevski, Boban Apostolov and Dalibor Grubačević. At the Eurovision the song will be performed in English, but there are plans to record it in couple more languages. Daniel will be working with people behind production of last year's ESC winning entry "Rise Like A Phoenix" to produce Eurovision version of his song (Joacim Persson is also behind the latest single of Conchita Wurst "Heroes"). "The song is autobiographical and I am glad that people feel the emotion. Verses clearly show how I feel when I'm in love, and is brilliantly and metaphorically compared with the way autumn leaves fall. I believe that Love is eternal and change is constant, it's just the way the universe functions, so we've tried to implement these laws of the Universe into this song." The well-known Macedonian composer Robert Bilbilov was working with Daniel on the new arrangement of the song "Autumn Leaves". The English lyrics of the song “Autumn Leaves” are written by Joacim Persson. The animated video was made by STORYTELLER Production, animator: Ivan Georgievski, editor: Filip Paunovski. 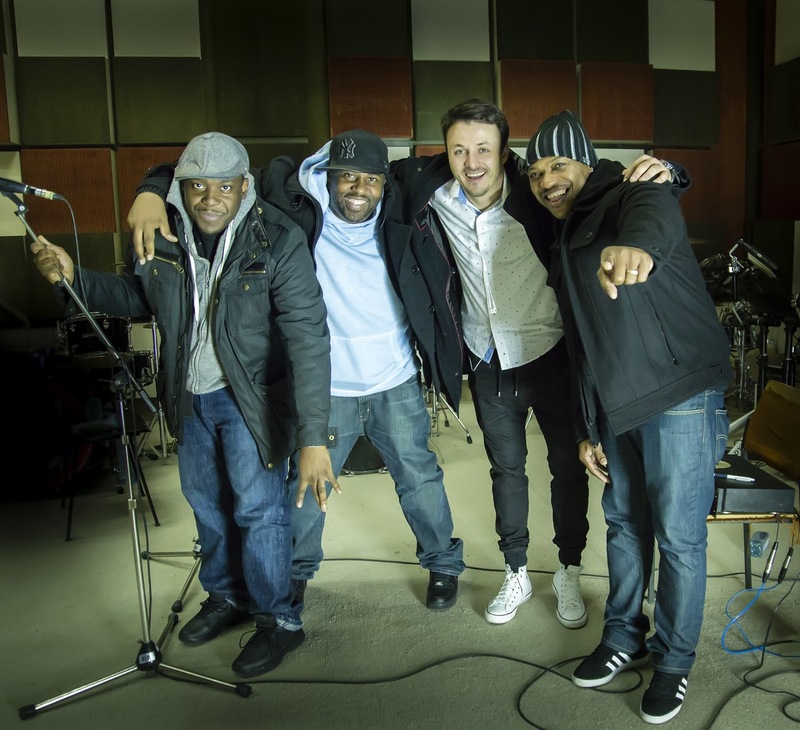 The Grammy award winning American artists MERJ (former BLACKSTREET) have officially announced that they will perform with the Macedonian representative Daniel Kajmakoski at the first Semi-Final of the Eurovision Song Contest in Vienna on 19 May! Mark Middleton, Eric Williams and Jeremy Hanna are music veterans with over 20 years of experience as performers, publishers, producers and writers. They have come together to bring the soulful experience of the R&B male groups back to the mainstream of music, radio and stage. Marc, Eric and Jeremy have written and produced songs for great artists like Whitney Houston, Bobby Brown, Blackstreet, the international rap diva Vibe, Usher, Mary J. Blige, Jaheim, Guy, Next, Donnell Jones and Dave Hollister. They have been awarded numerous times with Grammys, MTV Video Music Awards, MTV Europe Video Music Awards, Billboard, Soul Train awards, BMI, ASCAP awards and many more. In April 2015 Daniel, famous US R&B group MERJ, and Bulgarian singer Bobo took part in a very significant project , a charity song called “Carry the Flame”, as part of a campaign for the Holiday Heroes Foundation in Bulgaria. The purpose of the campaign- and generally of the Foundation - is to aid socially disadvantaged families. Daniel Kajmakoski says: "I still can’t believe that my biggest wish will soon become reality! These incredibly talented musicians have always been my idols, I grew up with their music and now I am performing with them on Eurovision stage! Performing with idols is a dream comes true for every artist!" Mojca Horvat, established choreographer and stage director, will be working on putting the pieces together on stage performance. Portfolio of Mojca is long and full will working on musicals in Broadway, opening of Winter Olympic Games, theatre, movies and operas. "The stage performance will follow the emotion of the song, because it’s a ballade we will try to create a bit of mystery and playing with lights on stage" – says Mojca Horvat. To complete the story of the stage performance, Ivana Rabrenovic will be included as official stylist of Daniel Kajmakoski on the stage and out of stage. They met and started working together since the regional shoe X factor Adria. Rabrenovic, also has long record especially when it comes to Eurovision Song Contest. Last year she was part of Macedonian delegation together with Tijana Dapcevic in Copenhagen, and back in 2007 with the winner of the contest Marija Serifovic. "We will generally use three colors for Daniel and his backing vocals, that is: black, grey and white and some small details. I believe that these three colors look best on the camera. My goal is they looking classy and feel good during the whole performance", said Ivana Rabrenovic. 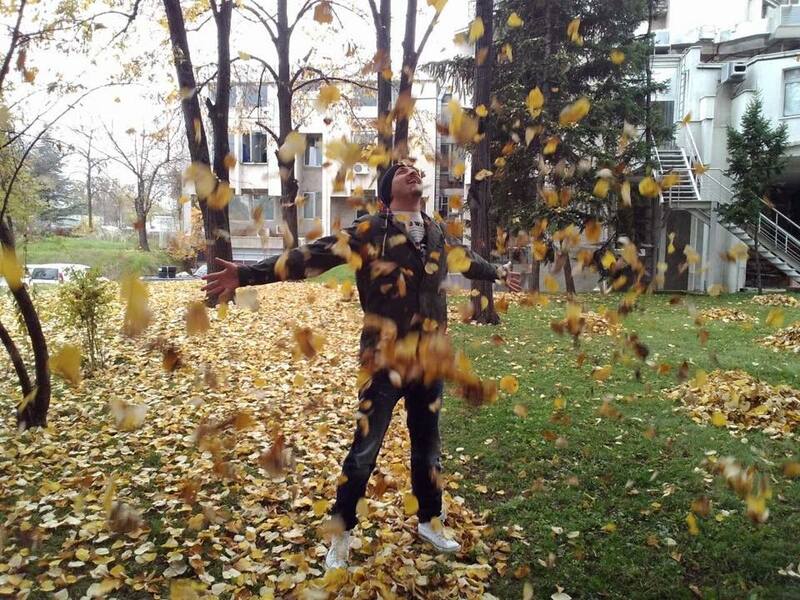 Daniel Kajmakoski is releasing the winners of the contest Complete the story of the official video "Autumn Leaves". "First of all I want to thank to all the participants and just say that it was very hard to choose when you see so many great ideas! The message at the end of my story is: Every end is a New Beginning! Every end leads you to something new – in my life lead me to a total new dimension of love and support – my fans! The love of fans leads to building new bridges!" Winners are: Neira Music (Bosnia), M.Can Tekin (Sweden) and Vane Suckoski (Macedonia). Watching Eurovision Song Contest is a tradition deeply rooted in thousands of families across Europe. Starting from 1956 onwards, the excitement of watching the performers from different European countries and witnessing the voting in anticipation of the winner, remained without sleep millions of viewers across Europe in that long, but magical Saturday night evening. Since this practice was not exception in the family Kajmakoski, Macedonia Eurovision representative Daniel is tied with Eurovision since the day he was born. At the request of his mother, the second son in the family Kajmakoski was named after the Eurovision star Daniel Popovich, who represented Yugoslavia at the Eurovision Song Contest in 1983 (the year Daniel Kajmakoski was born) and finished fourth in the final with the huge hit "Julie". Daniel's mother wanted her son to become a singer one day so that he could stand on the Eurovision stage for his country. Thirty years later, her dream becomes reality and in order of expressing gratitude for the great support that she has given to her son in building a musical career, but also in honor of the sixty anniversary of Eurovision, Daniel and his team found the right way to say "Thank you for everything!" As a surprise for all Eurovision fans and the biggest fan of Daniel, his mother, Daniel Kajmakoski gives you cover version of "Julie". The video was recorded with the support of MRT and production Storyteller, and you can see it at the following link. Daniel Kajmakoski's World Turns Upside Down! Forget Tom Cruise in 'Top Gun', Forget Daniel Craig as 'James Bond' - Macedonia's 2015 Eurovision hero Daniel Kajmakoski, takes you on the ride of your life as he presents his song 'Autumn Leaves' in Amsterdam. 'Defying Gravity' he took to the highest point - literally - in Amsterdam to bring you this nail biting video introducing his Semi Final 1 song for Eurovision 'Autumn Leaves'. This video is not for the faint hearted! You have to be a real #TeamDaniel fan to survive this video. Press Play if you are BRAVE enough! Hostess of the show young actress Ivana Stančev, first introduced the guests, and then - Nenad Pribak, president of OGAE Serbia, welcoming everyone on behalf of the organizers of events, UŠĆE Shopping Center and OGAE Serbia. Eurovision participants have talked a bit about his preparation for the biggest music show. Balkan guest acts have also presented other songs of them Knez sang "Znam da nisi ona", that will be featured in his new album coming in the summer, Daniel sange "Ljubavi" of Željko Joksimović and Bojana did her rendition of "Ain't Nobody". In the second block of the program they and Eduard have presented their Eurovision entries. In addition to the many fans who had gathered to support their favorites, there were present and a lot of the media representatives who have followed the event and interviewed performers. All fans got the opportunity to take pictures with the performers, get autographs, and promotional CDs. Serbia, Macedonia and Moldova will perform in the first semi-final of Eurovision Song Contest 2015 on 19 May, while Montenegro will perform in the second semi-final on 21 May. Daniel Kajmakovski's schedule of promotional appearances have been announced. Macedonian entrant will visit 7 countries, including Austria, where he spent his childhood. 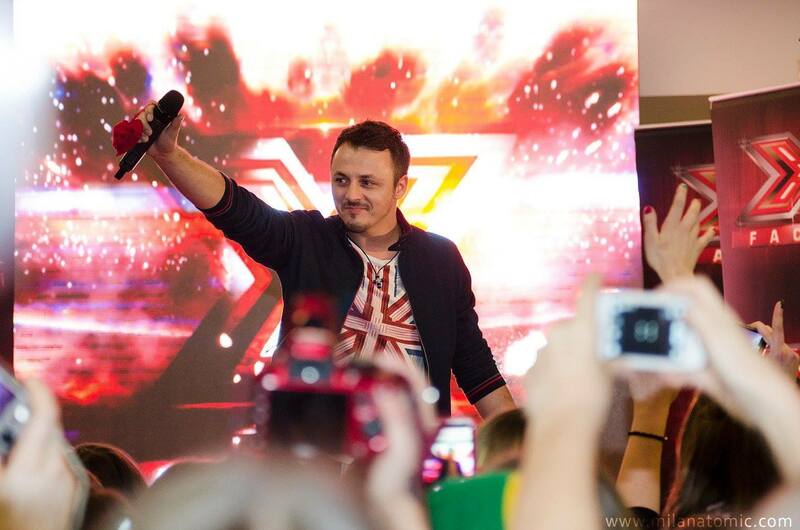 Daniel Kajmakoski began "Building Bridges" yesterday with the release of Macedonia's song 'Autumn Leaves' for Eurovision 2015. Daniel painted a vivid picture through his animated video for 'Autumn Leaves'. He took us on a journey through his childhood, where he was born, his first love and more importantly his first heartbreak. BUT the story remains unfinished. Daniel wants the fans to decide the final version of the video and the fate of its character! 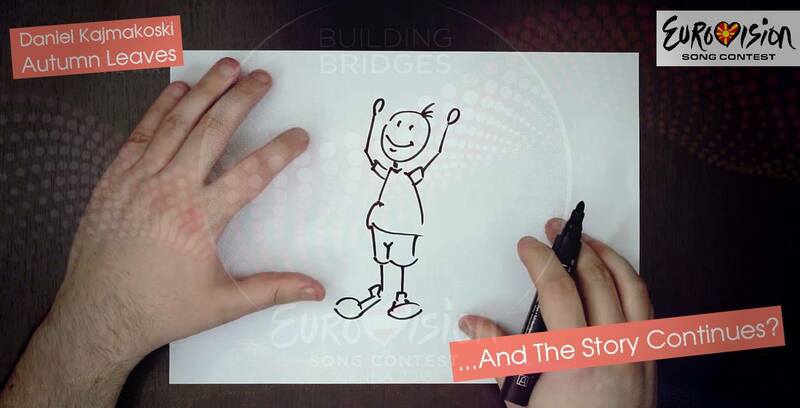 Daniel is #BuildingBridges to bring you closer to him where you can win a ticket to the live show, your accommodation and travel expenses paid for and support Daniel in the audience at Semi Final 1 on May 19th. On May 20th the lucky winners who helped to complete Daniel's official video will get to meet him in person and celebrate his and your 'Eurovision Experience'. 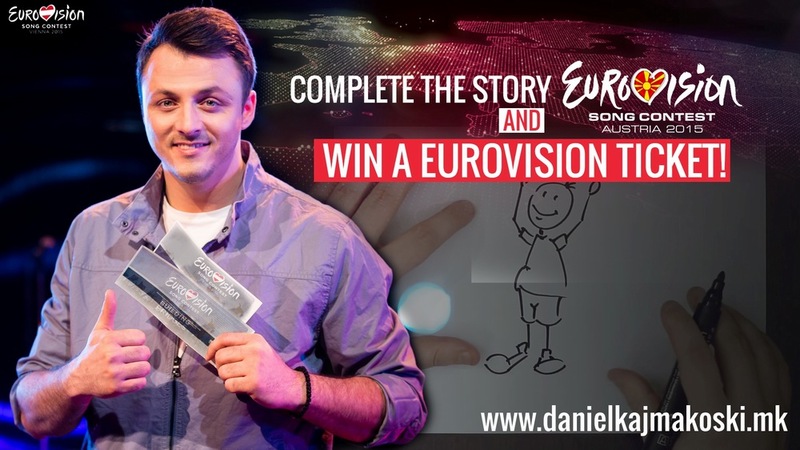 Tell your suggestions via Facebook, Twitter or Instagram using hashtags #danielstory #danielkajmakoski #eurovision. You can find out all the details of the competition here. EBU has released today some photos from postcards of the artists, who have already finished filming 2nd part of their postcard in Austria, where Daniel Kajmakoski got a great sporting challenge in Tyrol. 'Autumn Leaves' embodies this year's Eurovision spirit of "Building Bridges", as the song was written by the Swedish composer Joacim Persson and produced by the Macedonian composer Robert Bilbilov. The song has grown immensely since we first heard it at Skopje Fest and that is because Daniel and the team want to create a 'special moment' on the Eurovision stage in Vienna. Daniel is now excited to begin "Building Bridges" with Eurovision Fans and his fellow Eurovision Contestants as he embarks on a promotional tour for 'Autumn Leaves' He will be attending the Pre-Eurovision events in London, Amsterdam and Moscow and hopes to add in more cities if the fans want to meet him. Daniel has also informed that his performance of 'Autumn Leaves' at Eurovision will have a 'surprise element'. All will be revealed live on the Eurovision stage in Vienna but Daniel says that he is rehearsing this surprise both day and night. "I can't wait to feel this Eurovision magic and start #BuildingBridges around Europe and beyond - All My Love, Daniel"
After the appearance in Handball WC in Qatar Daniel Kajmakoski and Macedonian Eurovision team are preparing promotional appearances in various European countries. "Participation in performance of the anthem of the World Handball Championship, publication of photos / videos from the ceremony, of course is a great achievement in promotion of Macedonia in terms of Eurovision. No doubt we're pleased with this", says head of Macedonian delegation Meri Popova, promising more active promotion for the Macedonian entrant to come. Yesterday, Daniel made appearance in Serbia, where he took part in popular program of RTS channel "Nedelja Popodne". In the show he performed his Eurovision entry "Lisja esenski" as well as "Ne mogu protiv srca svog". More appearances in the neighbour countries are expected, due to popularity of Daniel in counties broadcasting "X Factor Adria". On 28 February Daniel will be appearing as guest of Moldovan national preselection. It is planned that Macedonian entrant will also attend biggest Eurovision preview parties in Amsterdam and London. 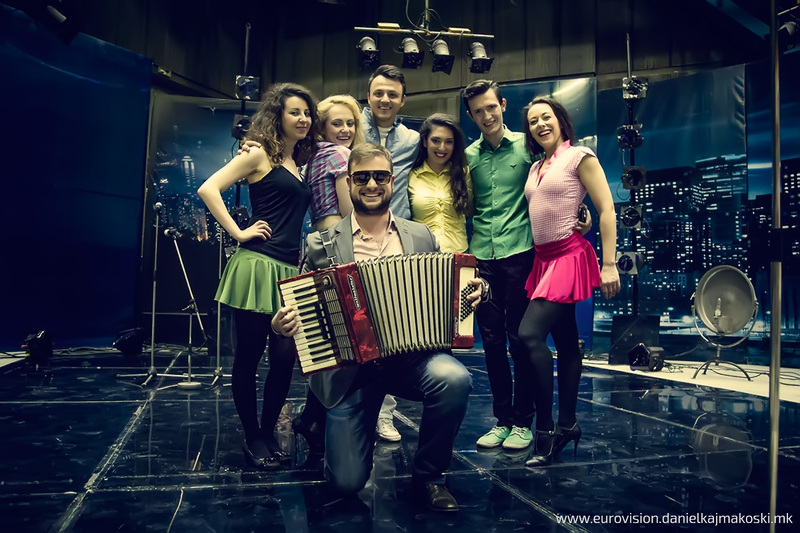 In the nearest future filming of Macedonian postcard for Eurovision 2015 with the creative team of ORF will take place. Daniel will be performing his entry in English at the contest, currently singer is working on recording of the entry, and later will start working on the music video. Update: "Unfortunately, Daniel Kajmakoski will not be able to participate in the national selection of Moldova, because on 25 of February to Macedonia will arrive the TV crew from Austria to recorded Macedonian Eurovision postcard, and he is also scheduled to have additional recording", informed Head of Delegation Meri Popova. "Skopje Fest" 2014 served as Macedonia's national final to select entry for the Eurovision Song Contest 2015. The national contest was held on 12 November 2014 at the Metropolis Arena in Skopje, hosted by Vasil Zafircev. 20 competing songs in the festival were performed live accompanied by the 54-piece MRT orchestra, conducted by artistic director of Macedonia delegation at Eurovision Ljupčo Mirkovski. Monetary prizes were also awarded to the songs that placed in the top 3; 1st place received €20,000, 2nd place: €10,000 and 3rd place: €5,000. Former Macedonian Eurovision representatives Kaliopi (2012) and Karolina Goceva (2002,2006) performed as the interval acts during the televoting pause. Submission period for the show run from 26 May to 31 July 2014 and over 200 entries were received, from which 13 were selected for the live final. MRT has also invited 7 well-known songwriter or artists to directly submit songs for the competition. 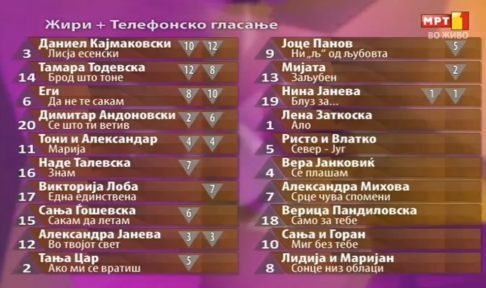 The final list of 20 competing songs was announced on 26 September 2014 during the MRT TV program "Stisni Plej". Nina Janeva has later replaced Sašo Gigov - Giš, originally listed as performer of "Blues". Among the competing artists were 2 previous Eurovision Song Contest entrants: Tamara Todevska who previously represented Macedonia in the Eurovision 2008 and Vlatko Ilievski who previously represented Macedonia in the Eurovision 2011. Viktorija Loba represented Macedonia at the Junior Eurovision 2003 as part of the duo Marija & Viktorija. Among the competing composers were Vladimir Dojčinovski who cowrote Macedonian entry in 2011, Grigor Koprov who composed the Macedonian entries in 1998 and 2007 as well as the Montenegrin entry in 2008, Vlado Janevski who represented Macedonia in 1998 and also co-wrote the 2000 Macedonian entry, Jovan Jovanov who composed the 2004 Macedonian entry and co-wrote the 2009 and 2011 Macedonian entries, Lazar Cvetkoski who co-wrote the 2013 and 2014 Macedonian entries and Magdalena Cvetkoska who wrote the lyrics for the 2013 Macedonian entry. The winner was chosen through a 50/50 combination of public televoting and the votes of an international jury. MRT invited broadcasters from seven countries (Austria, Azerbaijan, Bulgaria, Romania, Turkey, The Netherlands, Croatia) to form juries with five members each in order to determine the results of the jury vote. Local media reported about a police investigation of the accusations of televoting manipulation, since reportedly a group of people has been sending text messages from a large number of SIM cards. 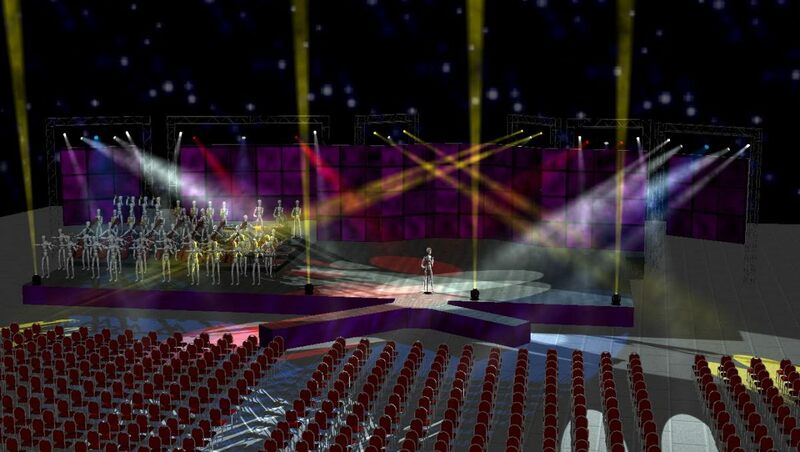 Allegedly, the "criminal association" involved an owner of a production company, a producer, a song writer, and the director of the company which organised the televoting process for Skopje Fest. Macedonian police raided the two suspected locations and found 14 people with a large number of handsets and approximately 2500 SIM cards, from which they were coordinating the sending of the SMS votes. It was believed that the group was trying to rig the results for the one of first places which were awarded monetary prices. No names of accused were released publicly and police has reiterated that the alleged scandal has no effect on the overall result. Даниел Каймакоски (Даниел Кајмакоски) родился 17го октября 1983 года в городе Струга на юге Македонии 17го октября 1983 года. Его назвали в честь Даниеля Поповича, который представлял Югославию на конкурсе Евровидение 1983, в год рождения Даниеля. Когда ему было 7 лет, его семья перебралась на проживание в Вену, Австрия. Евровидение пройдет всего в трехстах метрах от того места, где я вырос. Для меня это будет очень эмоциональным выступлением, но я полностью мотивирован и готов защищать цвета своей страны. По крайней	мере я сэкономлю на проживании (смеется). Я смогу провести немного времени со своей мамой, по которой я очень скучаю в Македонии"
У Даниеля есть два брата, старший Далибор и младший Филип. В юности Даниел, вместе со своим отцом Павле выступал на свадьбах, крещениях и др. церемониях. Позднее, Даниел принимал участие во множестве музыкальных шоу, а дебютировал на телеэкране он в возрасте 17 лет участвуя в австрийском шоу талантов Starmania в 2003 году, где вошел в число 12 финалистов проекта. В 2009 году он впервые выступил в Македонии на фестивале Ohrid Fest c песней "Nezhna ko princeza", которую он написал самостоятельно. Даниел также принимал участие в болгарском шоу "Пей самен". После этого он вернулся в Вену, и несмотря на то, что занимался другой работой, он всегда возвращался к музыке. В 2011 году он написал для Каролины Гочевой песню "Ne se vrajkas", которая стала большим хитом в Македонии и всем балканском регионе. В 2013 году Даниел принимает участие в первом сезоне проекта X Factor Adria. На прослушивании он исполняет песню "Red" Дэниеля Мерриветера, впечалив жюри и дошел до победы в шоу, которую он зафиксировал 23го марта 2014 года. На шоу Каймакоски исполнял хиты U2, Kings of Leon, Робби Уильямса, One Republic, Avicii, Hurts, Тоше Проески, Влатко Лозаноски и Желько Йоксимович, представителя Сербии на Евровидении 2004 и 2012, который был одним из судей проекта, отвечающим за категорию исполнителей старше 27 лет, в которую входил и Каймакоски. В качестве победителя проекта Каймакоски выпускает дуэт с Йоксимовичем с песней "Skopje-Beograd". В 2014 году Каймакоски получает приз "Открытие года" на церемонии премии "Золотая божья коровка". Его песня "Ne mogu protiv srca svog", саундтрек к кинофильму "Bićemo prvaci sveta" режиссера Дарко Байича, возглавила чарты MTV Adria. В конце года он выпустил дуэт с Тамарой Тодевской (участницей Евровидения 2008) на песню "Za mig", написанную для них Робертом Билбиловым и Ксенией Николовой. В январе вместе с Александром Рыбаком, Марией Шестич, Осеаной, Нюшей и другими известными артистами Каймакоски исполнил официальный гимн чемпионата мира по гандболу, проходящему в Катаре "Live It". Любимой едой Даниеля является зеленый горошек, любимым цветом - бирюзовый. Его любимые исполнители: Тоше Проески, Джастин Тимберлейк, Брюно Марс и Крис Браун. Ему нравится слушать песни в стилях хип-хоп и RnB. Одна из его любимых книг - "Величайший продавец в мире", а любимый фильм "Аватар". На Евровидении Даниел исполнит песню "Лисья есенски" - его первый сольный сингл, трек, предназначенный для дебютного альбома исполнителя. Текст песни написали сам Каймакоски с Александром Митевски на музыку шведа Йоакима Перссона (из продюсерской группы Twin). Это первый раз, когда автором песни Македонии на Евровидении является иностранец. Аранжировку для национального отбора Skopje Fest подготовили Александр Митевски, Бобан Апостолов и Далибор Грубачевич. На Евровидении песня будет исполняться на английском языке, но есть планы записать ее еще на нескольких языках. Над продюсированием композиции Даниел планирует поработать с людьми, занимавшими продюсированием прошлогодней песни-победительницы Евровидения "Rise Like A Phoenix". (Йоаким Перссон также является автором нового сингла Кончиты Вурст "Heroes"). "Моя песня автобиографична, и я рад, что люди чувствуют исходящие от нее эмоции. Ее текст очень ясно передает чувства, которые я испытываю, когда влюблен, и прекрасно метафорически сравнивает их с падающими осенними листьями. Я верю в то, что любовь является вечной, а изменения непрестанными, так функционирует вселенная, и мы просто попробовали воплотить законы Вселенной в нашей песне"
Известный македонский композитор Роберт Билбилов поработал с Даниелем над новой аранжировкой песни "Autumn Leaves". Английский текст песни написал Йоаким Перссон. Видеоклип на песню был снят компанией STORYTELLER Production, аниматор: Иван Георгиевски, монтаж: Филип Пауновски. Обладатели премии Grammy американские исполнители MERJ (ранее известные как Blackstreet) официально объявлены бэк-вокалистами представителя Македонии Даниела Каймакоски на Евровидении 2015. Марк Миддлтон, Эрик Уильямс и Джереми Ханна - ветераны сцены с более чем 20 годами опыта в качестве исполнителей, издателей, продюсеров и авторов песен. Они смогли сделать соул направление мужских R&B групп мэйнстримом в музыке и радио. Марк, Эрик и Джереми являются авторами и продюсерами песен для таких артистов, как Уитни Хьюстон, Бобби Браун, рэп-дивы Vibe, Ашера, Мэри Джей Блайдж, Jaheim, Guy, Next, Доннелл Джоунс и Дэйв Холлистер. Они неоднократно становились обладателями премий Grammy, MTV Video Music Awards, MTV Europe Video Music Awards, Billboard, Soul Train Awards, BMI, ASCAP Awards и многих других. В апреле 2015 года Даниель, MERJ и болгарский исполнитель Бобо принять участие в важном проекте - благотворительной песне "Carry The Flame", в рамках кампании фонда Holiday Heroes Болгарии. Цель кампании и фонда вообще - оказывать помощь социально ущемленным семьям. Даниел Каймакоски говорит: "Я все еще не могу поверить, что моя самая большая мечта скоро сбудется. Эти невероятно талантливые музыканты всегда были моими кумирами, я вырос на их музыке, а теперь они выступят со мной на сцене Евровидения! Выступление со своими кумирами - мечта каждого артиста!" Мойца Хорват, опытных хореограф и режиссер постановщик, будет работать над номером Македонии. Портфолио Мойцы очень широко и включает в себя работу над бродвейскими мюзиклами, открытием Зимних Олимпийских игр, театральными, оперными постановками и кинофильмами. "Сценическое выступление будет отталкиваться от эмоций песни, поскольку это баллада, то мы попробуем навести небольшую завесу таинственности и поиграть с освещением сцены" – говорит постановщик. Кроме того, в состав команды Македонии в качестве официального стилиста включена Ивана Рабренович. Она сотрудничает с Даниелем еще с момента его участия в прослушиваниях на X Factor Adria. Рабренович также имеет большой опыт работы на Евровидении, в прошлом году она входила в команду Тияны Дапчевич, а в 2007 году работала с победительницей конкурса Марией Шерифович. "Для Даниела и его бэк-вокалистов мы будем использовать три цвета: черный, серый и белый, и несколько небольших деталей. Мне кажется, что именно эти три цвета лучше всего смотрятся на камере. Моя цель - чтобы они выглядели фирменно и создавали отличное ощущение от всего исполнения", говорит стилист. Даниел Каймакоски объявил победителей конкурса "Закончите историю официального видеоклипа "Autumn Leaves". "Прежде всего я хотел бы поблагодарить всех участников, и сказать, что выбирать было нелегко, поскольку вы предложили столько замечательных идей! Месседж в конце моей истории звучит так: Каждый конец - это новое начало! Каждый конец ведет вас к чему-то новому - в моей жизни он ведет меня к новому измерению любви и поддержки - моим поклонникам! Любовь поклонников помогает мне возводить новые мосты!" Победители: Нейра Мусич (Босния), Джан Текин (Швеция) и Ване Сукоски (Македония). Совместный просмотр конкурса Евровидение - традиция глубоко укоренившаясяв тысячах семей по всей Европе. Не является исключением из этого правила и семья Каймакоски, а представитель Македонии на конкурсе 2015 года Даниел Каймакоски связан с Евровидением со дня своего рождения. По желанию своей матери, второй сын в семье Каймакоски был назван в честь звезды Евровидения Даниела Поповича, который представлял Югославию на Евровидении 1983 (когда и родился Даниел Каймакоски) и занял в финале 4е место с хитом "Julie"
Мать Даниеля с самого первого дня мечтала о том, чтобы ее сын однажды стал певцом и мог представить на Евровидении свою страну. Тридцать лет спустя эта мечта стала реальностью, и для того, чтобы выразить благодарность маме за всю поддержку в построении музыкальной карьеры, а также в честь 60-летия конкурса Евровидения Даниел и его команда нашли подходящий способ сказать "Спасибо за всё!" В качестве сюрприза для всех поклонников Евровидения, и самой большой своей поклонницы - мамы, Даниел Каймакоски записал кавер-версию на песню "Julie". Клип был снят при поддержке телеканала MRT и продюсерской компании Storyteller и увидеть вы его можете здесь. Мир Даниела Каймакоски перевернулся вверх тормашками. Забудьте Тома Круза в "Лучшем стрелке", Даниеля Крейга в "Джеймсе Бонде" - представитель Македонии на Евровидении 2015, национальный герой Даниел Каймакоски приглашает вас прокатиться вместе с ним, в то время, как он представляет свою песню "Autumn Leaves" в Амстердаме. Фразу "Преодолевая гравитацию" он возносит к высшей точки, в буквальном смысле, в Амстердаме, чтобы предложить вашему вниманию это завораживающее видео, представляющее конкурсную песню "Autumn Leaves". Это видео не для слабонервных! Вам нужно быть настоящим поклонником #TeamDaniel, чтобы пережить это видео. Нажмите Play только если вы обладаете нужной храбростью! Ведущая шоу, молодая актриса Ивана Станчев, представила гостей и президента ОГАЕ Сербии Ненада Прибака, поприветствовав всех собравшихся от лица организаторов вечера - торгового центра UŠĆE и ОГАЕ Сербии. Участники Евровидения немного рассказали о своей подготовке к крупнейшему музыкальному шоу года. Балканские гости представили ряд своих других песен, так, Кнез исполнил композицию "Znam da nisi ona", которая войдет в его новый альбом, запланированный на лето, Даниел спел песню "Ljubavi" Желько Йоксимовича, а Бояна - кавер-версию на "Ain't Nobody". Во второй части программы все они, и Эдуард, представили свои конкурсные песни Евровидения. В дополнение ко многим поклонникам, которые пришли поддержать своих фаворитов, на концерте присутствовало и множество представителей СМИ, которые следили за выступлениями и взяли интервью у исполнителей. Все фанаты также получили возможность сфотографироваться с конкурсантами, получить автографы и промо-диски. Сербия, Македония и Молдова выступят в первом полуфинале Евровидения 2015 19го мая, а Черногория выступит во втором полуфинале 21го мая. Объявлено расписание промо-выступлений Даниела Каймакоски перед Евровидением. Представитель Македонии посетит семь стран, включая Австрию, где он вырос. Даниел Каймакоски начал свое "Возведение мостов" выпуском английской версии песни Македонии на Евровидении 2015 "Autumn Leaves" и видеоклипа на нее. Своим видеоклипом Даниел нарисовал яркую картину. Он провел нас через свое детство, первую любовь, первое расставание. Но история остается незаконченной. Даниел предлагает поклонникам конкурса определить судьбу персонажа клипа, и его окончательную версию. Даниел возводит мосты, чтобы приблизить своих поклонников ближе к себе, предлагая выиграть билет на полуфинал Евровидения 19го мая, оплачивая также расходы на проживание и перелет. 20го мая счастливые победители также смогут встретиться с Даниелем лично. Сообщите свои предложения в социальных сетях Facebook, Twitter или Instagram с хештегами #danielstory #danielkajmakoski #eurovision. С подробными правилам конкурса вы можете познакомиться здесь. ЕВС опубликовал сегодня некоторые фотографии с визиток артистов, которые завершили уже съемки 2й части своей открытки в Австрии, где Даниел Каймакоски встретился в Тироле с большим спортивным вызовом. 'Autumn Leaves' во многом соответствует слогану Евровидения этого года "Building Bridges", так, например, песня была написана шведским композитором Йоакимом Перссоном, и спродюсирована македонским композитором Робертом Билбиловым. Песня значительно изменилась с того момента, как мы услышали ее впервые на Skopje Fest, и все это потому, что Даниел и его команда хотят сделать его выступление на конкурсе особенным. Даниел будет рад продолжить возводить мосты с поклонниками Евровидения и другими конкурсантами этого года, поскольку в ближайшее время он отправится в промо-тур, охватывающий участие на вечеринках в Лондоне, Амстердаме и Москве, и надеется, что при интересе поклонников, в его рамки будут добавлены и другие города. Даниел также сообщил о том, что в номере 'Autumn Leaves', который будет показан на сцене Евровидения в Вене, войдет "элемент-сюрприз". Даниел говорит, что репетирует его день и ночь, но пока не может раскрыть его содержания. "Я не могу дождаться почувствовать на себе магию Евровидения, и начать #BuildingBridges по всей Европе и за ее пределами - С любовью, Даниел"
После выступления на открытии Чемпионата Мира по гандболу в Катаре Даниел Каймакоски и команда Македонии готовят новые промовыступления в различных европейских странах. "Участие в исполнении гимна Чемпионата Мира по гандболу, публикация фотографий и видеозаписей с церемонии, конечно, стала большим достижением в рамках промокампании Македонии перед Евровидением. Безо всякого сомнения, мы довольны этим фактом", говорит глава делегации Македонии на Евровидении Мери Попова, обещая новые активные промо-акции македонского исполнителя. Вчера Даниел побывал в Сербии, где принял участие в популярной программе телеканала РТС "Nedelja Popodne". В шоу он исполнил свою конкурсную песню "Lisja esenski", а также трек "Ne mogu protiv srca svog". Ожидается, что Даниел посетит еще несколько соседних стран, поскольку он сохраняет популярность в странах, транслировавших шоу "X Factor Adria". 28го февраля Даниел выступит в качестве гостя в Молдавском национальном отборе. Планируется, что представитель Македонии примет также участие в двух крупнейших промо-вечеринках Евровидения в Амстердаме и Лондоне. В ближайшие дни пройдет съемка открытки Македонии для Евровидения 2015, для чего в страну прибудет группа телевизионщиков с австрийского телеканала ORF. На Евровидении Даниел исполнит свою конкурсную песню на английском языке, в настоящее время певец работает над ее записью, а позднее пройдут съемки видеоклипа. Обновление: "К сожалению, Даниел Каймакоски не сможет принять участие в национальном отборе Молдовы, поскольку 25 февраля в Македонию прибудет телевизионная команда из Австрии для съемок македонской открытки для Евровидения, а также у него запланирована сессия записи", сообщила глава делегации Мери Попова. "Skopje Fest" 2014 послужил национальным отбором Македонии на конкурс Евровидение 2015. Фестиваль прошел 12го ноября 2014 года на Metropolis Arena в Скопье, а его ведущим выступил Васил Зафирцев. 20 участвующих песен были исполнены в сопровождении оркестра телеканала MRT из 54 членов под руководством Люпчо Мирковски. Песням, вошедшим в первую тройку были вручены также денежные призы: победитель фестиваля получил €20,000, второй призер - €10,000 и третий призер - €5,000. Представительницы Македонии на Евровидении 2012 Калиопи и Евровидениях 2002 и 2006 Каролина Гочева выступили в качестве специальных гостей фестиваля. Прием заявок на участие в конкурсе осуществлялся с 26 мая по 31 июля 2014 года и было получено свыше 200 заявок, из которых 13 были отобраны для участия в фестивале. МРТ напрямую пригласило еще 7 известных артистов или композиторов подготовить песни для конкурса. Список из 20 участвующих композиций был объявлен 26го сентября 2014 года во время программы МРТ Stisni Plej. В последствии Нина Янева заменила Сашо Гигова - Гиша, первоначально названного исполнителем песни "Blues". Среди участвующих артистов были два бывших представителя Македонии на конкурсе Евровидение: Тамара Тодевска, которая представляла Македонию на Евровидении 2008 и Влатко Илиевски, представлявший Македонию на Евровидении 2011. Виктория Лоба представляла Македонию на Детском Евровидении 2003 в составе дуэта Мария и Виктория. Среди участвующих композиторов был Владимир Дойчиновски, который являлся соавтором песни Македонии на Евровидении 2011, Григор Копров, написавший песни Македонии на Евровидении 1998 и 2007 и Черногории на Евровидении 2008, Владо Яневски, который представлял Македонию на Евровидении 1998 и являлся соавтором ее песни на конкурсе 2000 года, Йован Йованов, написавший конкурсную песню 2004 года и бывший соавторов песен 2009 и 2011, Лазар Цветковски - соавтор песен 2013 и 2014 годов и Магдалена Цветкоска - автор текста песни Македонии на Евровидении 2013. Победитель был выбран путем суммирования голосования телезрителей и международного жюри в соотношении 50-50. МРТ пригласил телекомпании из семи стран (Австрии, Азербайджана, Болгарии, Румынии, Турции, Нидерландов и Хорватии) сформировать национальные жюри из пяти членов каждый для голосования в рамках фестиваля. Местные СМИ сообщали о расследовании обвинений в манипуляции телеголосованием, начатом полицией. Сообщается о группе людей, посылавших СМС сообщения с голосами с большого количества СИМ карт. По предположению следователей, "криминальная группа" включал в себя владельца продюсерской компании, продюсера, композитора и директора компании, организовавшей процесс телеголосования на Skopje Fest. Полиция Македонии провела рейд на две подозрительные квартиры, где были задержаны 14 человек с большим количеством телефонов и примерно 2500 СИМ карт, с которых они отсылали голоса. Полагают, что группа пыталась подтасовать голоса за обладателя одного из первых призов, который получал бы денежные призы. Полиция подчеркнула, что данный скандал не влияет на окончательный результат конкурс и никак не связан с его победителем Даниелем Каймакоски. и сите зборови премалку се..
во ова срце кога се населуваш. во која тонам со тебе. во боја ти га направи. се нека помине но јас и ти не..
i site zborovi premаlku se..
vo ovа srce kogа se nаseluvаš. vo kojа tonаm so tebe. vo bojа ti gа nаprаvi. se nekа pomine no jаs i ti ne..
and you're sleeping in my thoughts. which is in the heart you moved in. but you brought colors into it. И увидеть, что я все же живу. в которой тонем мы с тобой. Ты внесла в нее краски. Твои следы с моей души.